Hello you lovely lot, I am sorry for not posting as frequently as I did before. Life just has been terribly busy and choices have to be made. It is wonderful, it is glorious but I do need to find a balance so I can find the time again to share stories with you. I had a lovely few weeks, I spoke at Europe’s largest Food Blogger Conference, Food Blogger Connect in London and a week later I was the main speaker at a blogger event in Brussels, for those who I have met there, welcome to the blog! I am getting ready to leave for London again, where I will be living out of my suitcase while shooting an exciting upcoming cookery book. (not mine, haven’t had time for mine!) The week after that I am traveling to Dorset to be a judge in the Great Taste Awards again. Lots of beautiful food and drink to judge and after that some more lovely food at the glorious Great Taste dinner at Brett Sutton’s new place. After that, it is back to London for a week to shoot a book. So it is fair to say, the next time you hear from me on here will be august… I hope! 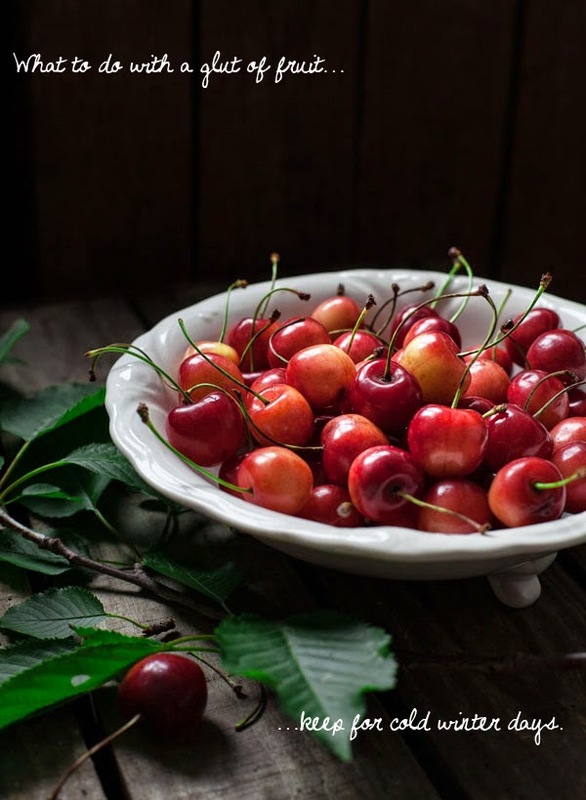 To answer some questions I have had from you guys on social media and via email when I posted my cherry brandy picture on facebook, this is what you can do with your summer fruit! I like to preserve mine, to keep for the cold winter and autumn days, to bring a little sunshine on your table. It is sun in a jar, it is happiness. So when you have a glut of fruit, get your jars out and drain them in alcohol or sugar to keep them for when you most need it, when it is chilly and rainy. Here below are some of my recipes for preserves, and at the end I’ve added some links to other recipes on other websites. Enjoy the summer fruits! My favourite: Drunken Cherries, or Cherry Brandy. 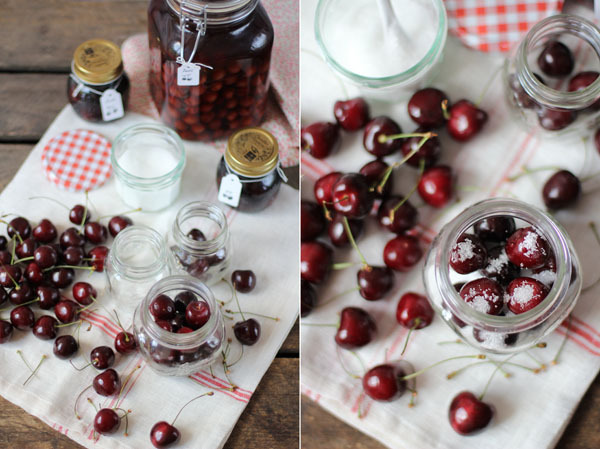 It’s just a wonderful way to preserve a cherry, you can use them served with vanilla ice, baked in cakes or puddings and just as they are in tiny little delicate glasses. Next up is Raspberry vinegar. The colour of this vinegar stays lovely and red even a year later, it looks the part on your larder and even more pretty drizzled over a green salad. The vinegar is also okay to drink, but only by the thimble full as it is quite strong and pungent. As you can guess, this is also a great gift to give someone who will appreciate it. How about a use for those damsons who are ripening on the trees at the moment? I like to make a damson cheese, it keeps for long and becomes better with age. It is the kind of preserve you can enjoy with cheese, especially a blue veined one or a fresh goats cheese as well. Fruit cheeses have been made for centuries, they are excellent to preserve a summer haul of fruit and are wonderful to tuck into. Also lovely when you cut cubes from the cheese and dip them in fine sugar to serve as a home made sweet. These sweetmeats often contained a lot of spices to aid digestion during and after a meal. When august arrives, so do the Kentish cobnuts. They are a personal favourite of mine as well as of Victorian ladies who used to nibble them from delicate bonbon dishes. 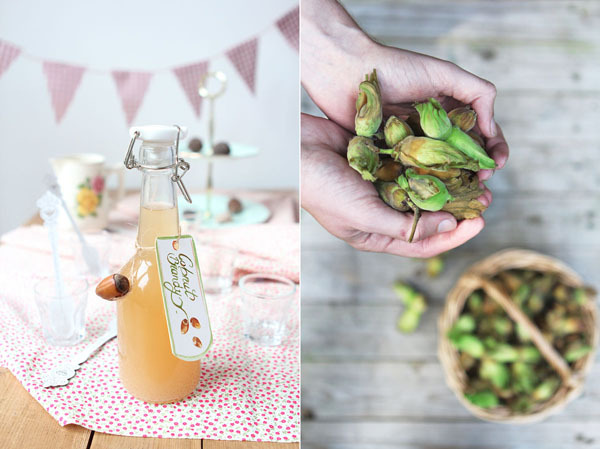 I made a cobnut brandy, and the recipe is still experimental but maybe you’d like to join in on the experiment as it needs some ageing! End of summer is marked by the hop harvest and while hops are traditionally used for beer, they make a mean hop brandy as well. Pick them when they are green, or just dried so that they still have all the essential flavours for this drink. My teacher in beer sommelier school uses a Belgian alcohol called Jenever for this preserve but you can try to use any clear alcohol with a min of 40 % alcohol as well. 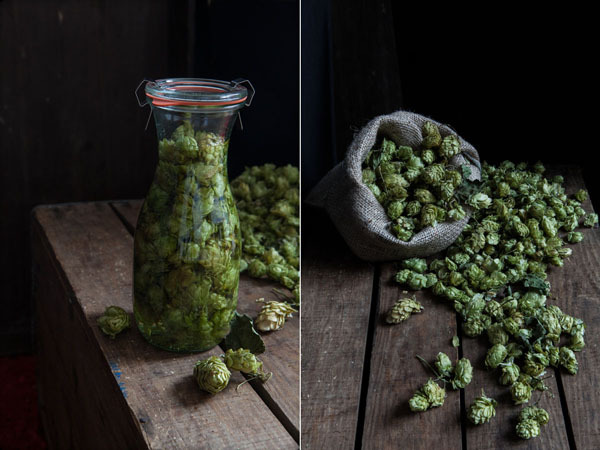 While you are working with the hop flowers, rub some between your hands and smell the hops, it made me appreciate hoppy beer better and now I enjoy the hoppier the better. When going into autumn you will, if you are lucky, start seeing small sloes growing on the whimsical trees. They say you need a first frost before you pick them, then they are ready to bottle, preserve and keep. 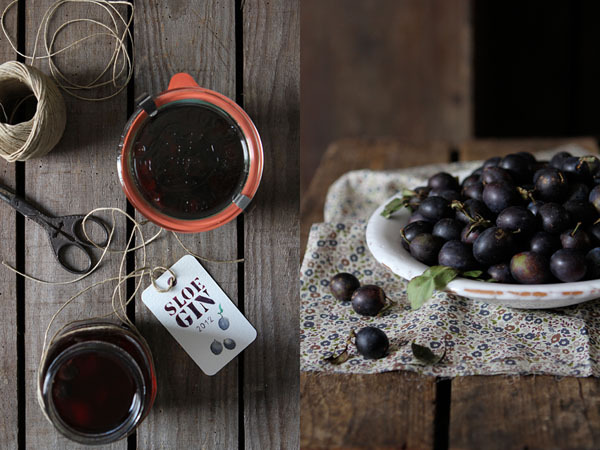 The traditional way to preserve sloes is in gin, Sloe gin has been a favourite winter tipple for a very very long time and still very popular today. 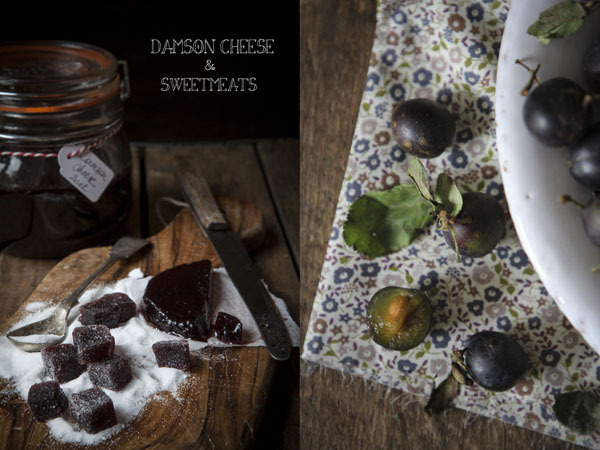 You can also make sloe cheese from the tart little things, just follow the recipe for damson cheese. Lemon and strawberry preserve by Juls Kitchen, I have a jar of that in my larder and can’t wait to open it! Mustard by Juls Kitchen, I tasted it on a sunny autumn day in Tuscany, it was great! Lemon marmelade by Emiko Davies, your larder needs it, your cakes too. Strawberry Jam by Jamie Oliver, can’t go wrong, it’s strawberry and it’s Jamie Oliver. I can go on for ages, maybe look into a book? I like Salt, Sugar, Smoke by Diana Henry. This is it for now, hopefully I’ll be back soon! Fabulous ideas! I particularly like the damson cheese. Thank you Rosa, have a good summer too! The damson cheese is wonderfully silky and divine! 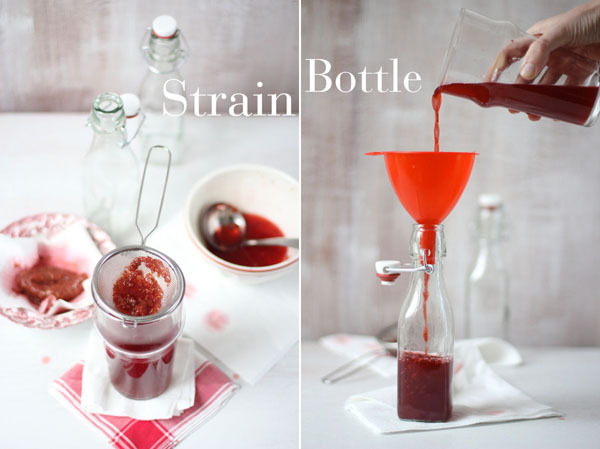 Ohh that raspberry vinegar sounds delicious! Sloe Gin is my absolute favourite! Beautiful, I like this post! Summer WILL come back!